A new chapter in the history of the Minnesota Vikings begins in 2016 as they open the newest stadium in the NFL, US Bank Stadium. The Vikings have been a part of the Minnesota sports scene since 1961 when they began playing at Metropolitan Stadium. Throughout their history the Vikings have never had a stadium of their own, sharing both stadiums with baseball’s Minnesota Twins (until 2010 when Target Field opened). In the early 2000s the Vikings lobbied numerous times to secure support from the State of Minnesota to fund the construction of a new stadium. On March 1, 2012 the Vikings were successful as Minnesota Governor Mark Dayton announced that a new stadium would be built on the site of the Metrodome. Built at a cost of $1.1 billion, the stadium financed by the Vikings, the City of Minneapolis and the State of Minnesota. For two seasons the Vikings played at TCF Bank Stadium, home of the NCAA’s Minnesota Golden Gophers, while the Metrodome was demolished and their new stadium was constructed. Construction began in late 2013 and in June 2015 US Bank purchased the naming rights for $220 million over 25 years. US Bank Stadium opens in July 2016 and the Vikings will play their first game here on September 18, 2016 against the Green Bay Packers. Located in downtown Minneapolis, US Bank Stadium is a bold and iconic building. The structure is like no-other in the NFL. It features a fixed, slanted roof that is 60% transparent allowing natural light to filter inside giving it an outdoor feel. 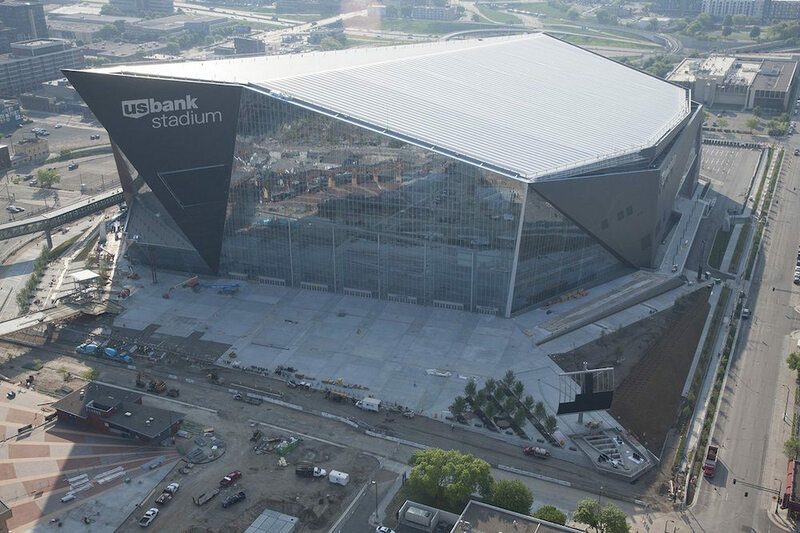 Featuring a black zinc facade, the majority of fans enter the stadium through the west side, known as the Medtronic Plaza, a three-acre gateway to the stadium that contains one of the most iconic features at US Bank Stadium, a 160 foot long legacy Vikings ship. Modeled after an ancient Viking’s ship, it features a 2,000 square foot curved LED videoboard that serves as the ships 55 foot tall sail. The plaza provides a great gathering spot for fans before and after games. Once inside US Bank Stadium, there is no question you are at the home of the Vikings as over 66,000 purple seats surround the playing field. The stadium consists of multiple seating tiers, with the lower deck surrounding the field. The best seats in the house is right on the field, as US Bank Stadium has 23 Turf Suites that puts fans 25 feet from the action of the field. Approximately 6,000 seats in the lower level on the north side of the stadium are retractable allowing US Bank Stadium to host numerous events, including the Minnesota Golden Gophers baseball team. 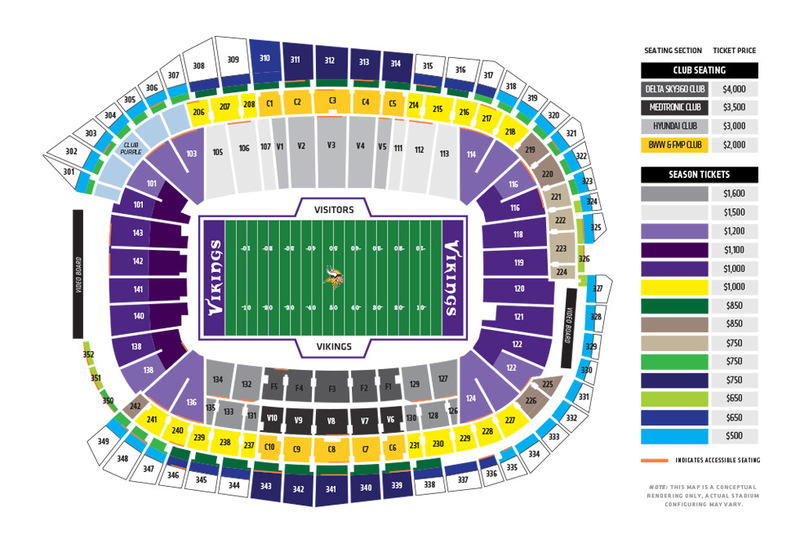 One of the most unique features at US Bank Stadium is located beyond the lower level seats on the west side. Here are five, 95 foot high, pivoting glass doors. Not only do these doors allow fans to see the Minneapolis skyline, but opens the stadium to the outside elements when the weather is warm. 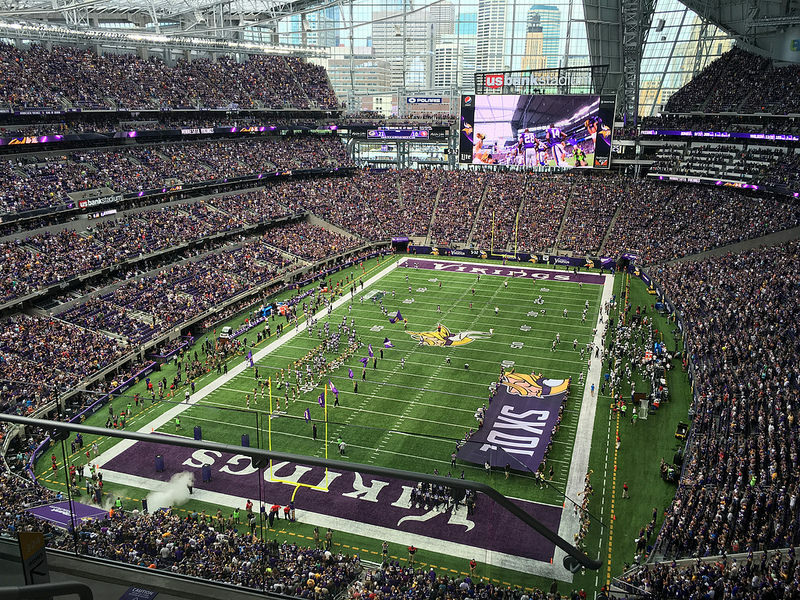 Many amenities can be found at US Bank Stadium, including multiple 131 luxury suites, 9,000 club seats, numerous club areas, and Club Purple, a fantasy football lounge. Two 50′ x 120′ HD video/scoreboards are located at both endzones. Not only will it host football, but the US Bank Stadium will be the most versatile stadium in the NFL as it will host baseball, basketball, motocross, concerts and more. It is scheduled to host Super Bowl LII in February 2018 and the 2019 Men’s NCAA Basketball Final Four.